GALION — After 28 years working in a factory, Brian Parsley was ready for a new challenge. Eighteen months ago, Brian, his wife Erika, son James and daughter Zoey, started PF Sanitation. Their refuse collection company has grown faster than anticipated, and about a month ago they moved the business from their home to uptown Galion, where PF Sanitation LLC now has a storefront office, with a red and white banner above the door at 126 Harding Way East. The family didn’t just jump into the refuse business. They first did some market research to see what kind of businesses were needed in the Galion area. “The two we came up with were tree trimming, and trash service. I hate heights, so the decision was pretty easy,” Brian said. On Monday morning, Erika was answering the PF Sanitation and responding to customer inquiries. Zoey was working around the office and Brian talked about the business. James drives the truck and was out, well doing what people expect, PF Sanitation to do. PF Sanitation picks up two days a week in Galion. One day they do the rest of Crawford County, which includes New Washington, Sulphur Springs and more. And they pick up in Morrow County. “We’ll also clean out a garage or a basement or a house,” Brian said. The family is pleased with the decision to move the office to uptown Galion. Currently, PF Sanitation charges $16 a month to collect up to five bags a week. Brian admitted fees for new customers are going to go up a little next month. “But we’re still going to be cheaper than most of the others,” he said. However, low prices is only one marketing strategies PF Sanitation uses. “Our thing is customer service,” Brian said. “When we pick up, we’re going to put the lid back on the trash can. If it’s really windy, we’re going to put the can out of the wind. We also try to clean up as well as possible after we pick up. “I like to think that is where we are different. We’ll go that extra mile. If someone is sick, or breaks a leg and they can’t get the trash out to the street … if they call us and let us know, we’ll go out back and get it,” he said. “People appreciate the extra service. PF Sanitation operates one side-loading garbage truck and a pickup truck. Brian said he wouldn’t exactly call his new job relaxing, as there is still a lot of work involved. For more information, call PF Sanitation LLC at 419-617-2221 or stop at the 126 Harding Way East business. 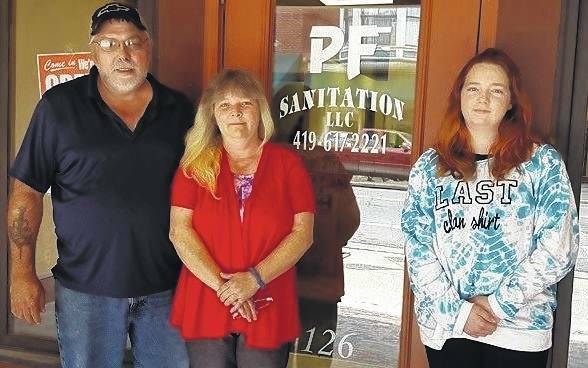 Russ Kent | Galion Inquirer Brian, Erika and Zoey Parsley stand in front of the new uptown Galion office of PF Sanitation LLC. The new refuse collection company is at 126 Harding Way East. Call 419-617-2221 for information. https://www.galioninquirer.com/wp-content/uploads/sites/38/2017/06/web1_PF-1.jpgRuss Kent | Galion Inquirer Brian, Erika and Zoey Parsley stand in front of the new uptown Galion office of PF Sanitation LLC. The new refuse collection company is at 126 Harding Way East. Call 419-617-2221 for information.